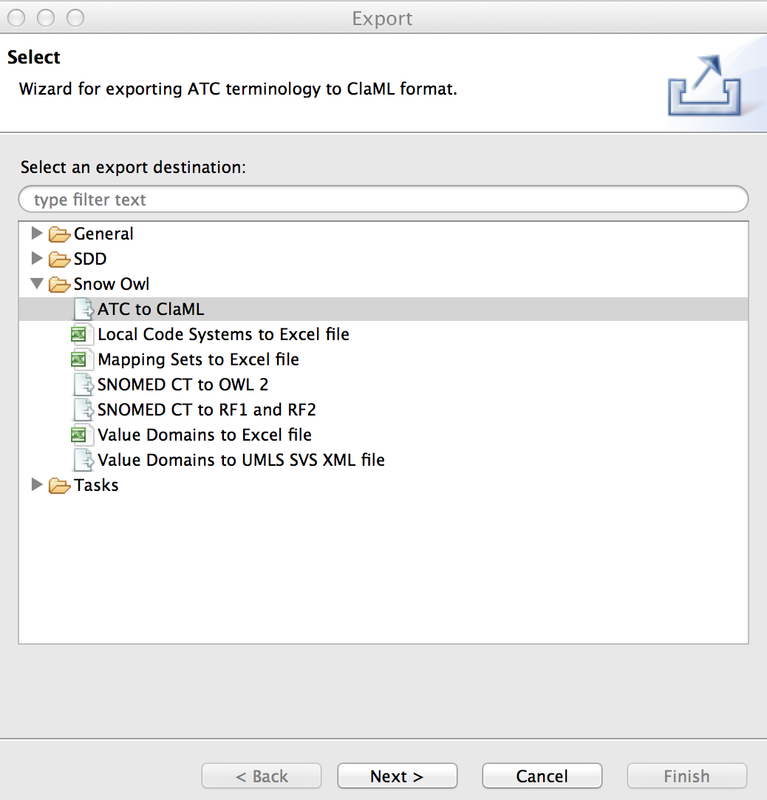 Snow Owl supports importing ATC releases in XML or ClaML format. Please note that due to licensing restrictions, Snow Owl does not distribute the ATC release which will need to be obtained from the World Health Organization. The particular file you need to download from the WHO is called ATC classification index with DDDs - XML format. ClaML (Classification Markup Language) is an xml data format specification that is used for the exchange of medical classifications, which are code numbers for of medical diagnoses and procedures. 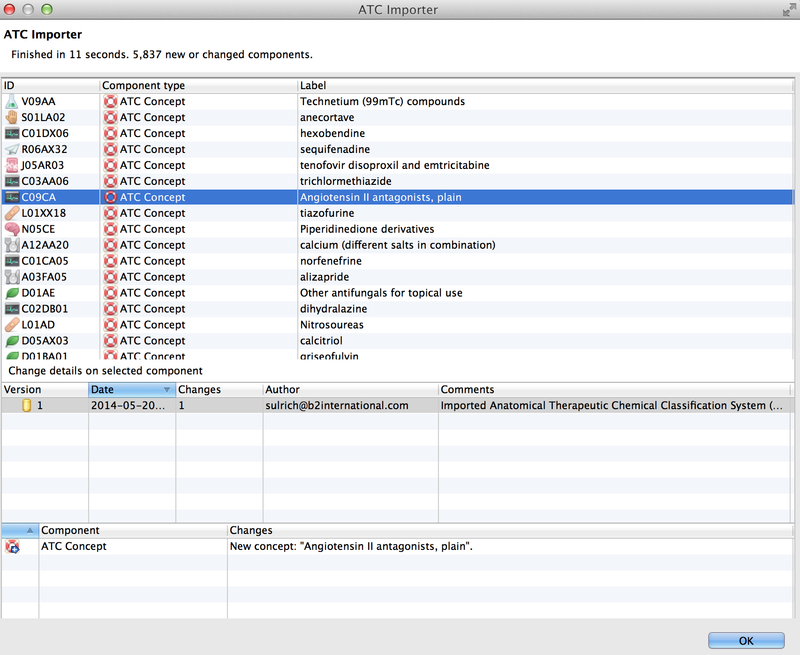 If you are exporting an ATC release in Snow Owl the generated file will be in CLaML format. Select Snow Owl > ATC from WHO XML from the list, or Snow Owl > ATC from ClaML and click Next. Import the ATC codes into the existing database. This will merge the import content with the existing data without deleting any content. Delete the existing ATC content, this will overwrite the existing ATC codes. You should also chose this option when your ATC view is empty. If you chose to delete the existing content, you will be prompted to confirm your command. The import should only take a few seconds. After the import, a list with the import results will be displayed. If you imported a new version, the differences between the old and the new version can be reviewed here. Click on code to see the changes displayed in the bottom section. You can see if a new component was added, or if an existing code was modified or removed in the new version. If you imported ATC for the first time, all items will be displayed as added. Note: When you are using Snow Owl for the first time, the ATC concepts view might be empty. In this case, you will have to import the ATC release file into Snow Owl as described above. To open the import wizard, just click on Import ATC from a CLaML file ... in the ATC concepts view. Please contact your national release center about the ATC license. Snow Owl allows you to export an ATC release in CLaML format. Go to File > Export... in the Menu to open the wizard. Select Snow Owl > ATC to ClaML from the list, and click Next. Specify the export location on your computer hit Next to start the export. After the export you can follow the link to the export file.